"The school of the child"
(Extract from "Profil der Montessori-Pädagogik und ihrer Einrichtungen"(=Profile of Montessori Pedagogy and its Institutions), worked out by Prof. Dr. Hans-Dietrich Raapke, University of Oldenburg, and the expert group "Theorie" of the trainers' conference of the German Montessori Association). The "school of the child" is not a school for the child. According to Montessori and according to the knowledge of today's developmental psychologists, children of this age are highly eager to learn. Their "hungry intelligence" needs plenty of "food". They want to know all about this world and are now able to create coherent images of the world and its parts beyond their concrete perception. At that age the development of the intelligence therefore aims at two things: the ability of abstraction and the powers of imagination. The "seed of science" is sowed here. 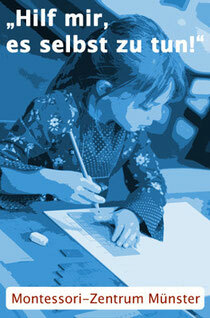 Nevertheless, in Montessori's opinion, children of this age are often demanded too little of or in a wrong way. the idea of a universe organised according to the laws of nature, created by God and left to man in order to work on and complete it. It is about man's position in the world and about man#s knowledge of the mutual dependences of all natural phenomena. the "cosmic task" of man to preserve the things he is entrusted with and to complete them. It is about helping the adolescents to gradually take their own share of the responsibility for themselves and this world. That is why Cosmic Education - despite many points in common as regards content - is not identical with the social studies and science at regular Primary Schools. However, the similarities with today's ideas of the ecology movement are unmistakable. Montessori used the term "ecology" in the context of Cosmic Education herself (cf. Montessori, Maria: "Kosmische Erziehung", 5. Auflage, Freiburg 2002; cf. Eckert, Ela: Maria und Mario Montessoris Kosmische Erziehung - Vision und Konkretion, Bad Heilbrunn 2001; Fischer, R./Klein-Landeck, M./Ludwig, H. (eds. ): Die "Kosmische Erziehung" Maria Montessoris, Reihe Impulse der Reformpädagogik Bd. 2, Münster 1999). In practice, it is often necessary to make compromises. Montessori schools must adapt in a way to the regular school system, especially as far as the curriculum is concerned, that students have the possibility switch to a regular school at any time. "universal curriculum" - This is a survey of topics structured according to basic human abilities (speaking, writing, reading, calculating etc. ), human needs (food, clothing, accommodation, spiritual needs, religions etc.) and subjects (mathematics, physics, chemistry, biology, geology, history, arts etc.). From these topics the students choose, mostly with some help, their particular work either individually or in groups. Every child chooses its individual way, which does not exclude group work since children can work on their own or in groups as the case arises. The classes consist of children of different ages, in general three forms, but also two or four forms together. The "school of the child" should be responsive to the children's thirst for knowledge and the children's ambition to be explorers and adventurers. The children should have the chance to expand their mental, social and cultural range of activity. The broadening of the knowledge of the world should be the means for the transition to abstraction. In the prepared environment - in modern words: the cultivation of learning - at school as well as in the steps outside social and moral consciousness can be formed. With the special sensibility to justice, which is typical of their age, children can develop the ability to assess their own and others’ actions.